It is no secret that CLANDESTINE BLAZE is one of the major forces that have inspired me over the years to get involved with this music. No big words, no fancy pictures, but when the record spins in the stereo a whole world (in fact the true, horrific image of the world we live in) unfolds through its lyrical and musical concepts. 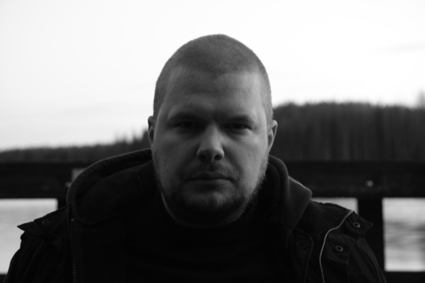 The Anti-flesh Nimbus is honored to host a great conversation with Mikko Aspa, one of the most important voices of blackmetal (an not only that) of all times. I) Greetings mr. Aspa. More than 15 years have passed from the beginning of the CLANDESTINE BLAZE entity. What drove you to start this project among a then decaying blackmetal scene? I think Black Metal at that point was not only decaying. In fact, one could say in many ways it was blossoming again. 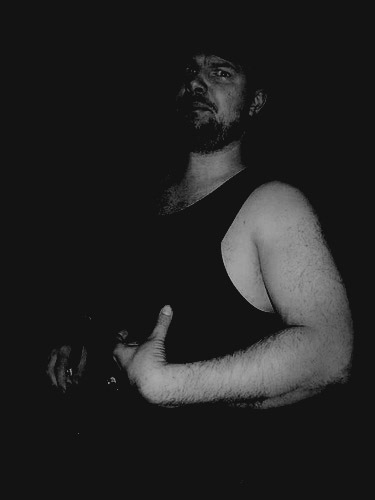 Perhaps in mainstream or semi-mainstream settings, commercial or soulless black metal was at rise, yet in Finland amongst other countries, you could see dozens and dozens of new unsigned bands capturing new spirit and new approach in many ways. Exciting things was happening. Also one could remember that information would travel quite slowly. News of things that happened already some years ago, would reach finally isolated persons who operate in dark underground. Despite the peak of Norwegian black metal might have passed, there was new levels of extreme forces rising. I was not at all impressed by standard heavy metal sound quality and fashionable promotional photos of big bands. I was much more drawn towards such atrocities like “Vampires Of Black Imperial Blood” (1995), “March To The Black Holocaust” (1995), “Thy Dying Light” (1996), “Following The Voice Of Blood” (1997), “Black Hateful Metal” (1997), and so on… And one could mention around same time as CLANDESTINE BLAZE (before or after) was rising hordes as WARLOGHE, PEST, UNCREATIONS DAWN, BLOODHAMMER, NIGHTSIDE, HELWETTI, and countless others, I could care less if mainstream of metal was “decaying”, as new hungry forces were gathering strength in shadows. I was not part of metal mainstream, nor I feel I’m part of it now. Back then it felt like interesting things was about to happen, and looking back now, I feel there was. Lots of albums what may not be regarded as classics by global metal media, but certainly things that took black metal further from what it had been. II) We are now almost a year past the latest release of yours. Do you feel that “Harnony Of Struggle” has fulfilled your goals and intentions, if any, behind it? Intention was to make good album, and I think that’s what it is. I had no goals for any kind of clear reactions, media attention, or sales. Like usual, it just came out. No promotion, no merchandice and no goals for touring or huge sales. Album came out as I wanted, and it remains to be seen whether other people feel strongly about it like I do. Of course I would appreciate situation where lyrical approach would influence people, but I don’t think such things can be measured or observed. III) What sort of harmony lies within struggle? Do you have the belief that eternal conflict of all kinds is the major force behind evolution? Yes. I don’t think its matter of belief, rather than pure fact. Harmony is exposed when you zoom out from petty issues of miserable humane obstacles (what appear to be “non-harmonic”), to cold view from distance. While most of humanistic worldviews tend to tremble in horror, it is really the struggle what makes man the man he is. Un-named forces that truely creates man, does it through scorn and misery. And that force is worth to worship, if something is. IV) What is the process of songwriting for CLANDESTINE BLAZE? I am asking because, in the last two albums especially, there is the feeling of a certain flow and continuity between tracks. As if one song evolves into the next one. It is like the whole album was written on one take. In these cases, it is not only the composition of each individual track that matters, but very careful attention to wholeness what works as album. Transition of mood from track to another and through entire playtime of c. 20+20 minutes (LP) must flow well. It is not only matter of good riffs or good songs, but in some occasions even intentionally “bad” song might be necessary. This was especially true in “Falling Monuments”, where songs that are not good as music, were required to suit the feel of lyrics and purpose of album. It is also notable that “Harmony Of Struggle” includes some conceptual choices, as albums progresses to operate purely in simple harmony (musically). Latter part of album goes in harmony of one single tone. Material of these albums have been composed over long period of time. Starting right after previous album was finished, till last moments when recording of album started. But as mentioned, arrangement of final album was done carefully, taking into consideration atmosphere what was aimed to be reached. V) I think that “Harmony…” turned out more aggressive than its predecessor. Were you pissed off about certain people or situations during the last few years? Perhaps, but I don’t intend to involve mundane feelings into creation of timeless works. It’s most of all that “Falling Monuments” deals with melancholy that man faces in front of inevitable, while “Harmony Of Struggle” dives into hostile world of accepting it, and worshipping it. This has to be audible in music as well or otherwise it would be incompetent expression. VI) Lyrically, you differ both from the traditional Satan-worshipping themes of the early 90s as well as from the recent occult manifestations coming from numerous bands. Instead you prefer to write about human weakness, torment and decay. Why do such situations attract you? When repeating certain common phrases or dealing with seemingly purely aesthetic elements of occultism, one often may feel question: What does this mean and why it should matter? If one would assume you’d worship satan, and repeat lyrical passages about worshipping satan, it will still often make one wonder: So? Even if lyrics I write may not be always bluntly clear (often they are), they are very concrete. It’s words that are said for other reason than filling vocalists needs. Main difference to me seems to be that vast majority of those who deal with spiritual matters, follow idea that the spirit, divinity and “knowledge” are somewhere out there and all they can do is get glimpse of something from beyond. But they like to keep “reality” and the other side separate. I believe in necessity of abandoning this, as it compares merely on illusions of paradice. Always reason for passivity or compromise, someone waiting and waiting for something to happen next. Even if supposedly being able to gain brief glimpses of the other side, remaining unable to bring anything here. I’d be interested how faith transforms ones perception, action and general worldview. I’m interested in how ones faith or belief is manifested HERE. VII) What is the concept behind the “Harmony…” cover artwork? Will we ever see a non-black/white cover on a CLANDESTINE BLAZE record (apart from the original edition of the first full-length of-course)? 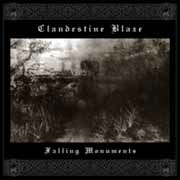 Wasn’t “Falling Monuments” color cover? Certainly single tone, but still. I have no plans for future regarding covers, but generally I prefer b&w as opposed of color. 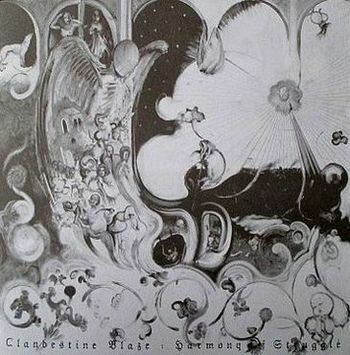 Concept of “Harmony Of Struggle” cover is simply to depict many of the elements included in lyrics of album, in slightly Bosch-esque manner. One can find small details with clear or symbolic meaning. I wanted to avoid all too obvious snakes and chalices things what nowadays serve often mere decorative purpose. Original sketch was done by myself and final design and actual painting by J.Siikala. He has painted several Northern Heritage album covers and talented painter able to bring something personal to work he does. VIII) As of today, where does CLANDESTINE BLAZE stand in a western world where the cultural dictatorship of the social media has given a stand on everyone to publicly express his opinion on everything, whether he has any knowledge for the subject or not? As a band or artistic outlet, Clandestine Blaze doesn’t have any “stand” on such matters. If you ask me personally, it is of course great sign of cultural regression. While many westerners live in excess of information and possibilities, what they end up doing is the celebration of least demanding and least relevant things. When most popular media and even social interaction is celebration of meaninglessness and pettiness and underlined stupidity, what can you say? However, I think this dark age of small men will eventually change. IX) Has anything changed regarding your intentions to do a live show? Maybe a special one-off appearance in a festival like Black Flames Of Blasphemy? I may have mentioned we did rehearse for potential live show already half dozen years ago, but it was decided to not be done. Since then, I have occasionally mentioned that it may happen if reasons are right and situation seems correct. However, I don’t feel comfortable about festival settings or touring for Clandestine Blaze. But I’m also equally repulsed by idea of “special set”, as I believe most of Black Metal live shows suffer from that exact reason. Bands that are not really live bands, go on stage to do something what isn’t natural for them. Much better are bands who simply play like in old days. Live gigs done in small venues, because they are actual band that rehearses and is alive. X) Apart from CLANDESTINE BLAZE and other music projects, you run the Northern Heritage label. What is the philosophy behind its releases? Also, contrary to the main current, why do you avoid special editions with limitations, color vinyls and such stuff? I believe Black Metal, as it appeals to me, is force against modern world. Even if being seemingly young style of music, often performed with most recent musical technology, in its heart, there is other kind of flame. I believe economy should be in service of culture and spirit, not the other way round. This applies to world as whole, but also black metal. When labels treat black metal as consumer product and method of abusing the most horrid consumer impulses, it appears to be just like any other business out there. I certainly admire so called artists editions, where something personal, possibly handmade, is included. Version that adds even spiritual value to item itself. Be it artwork, additional texts, more personalized packaging, etc. If what you get is different color plastic or cover art blown up to size of big poster, what’s that for? Northern Heritage philosophy is to be at service of specific culture and ideal. As label, I release bands who appeal to me and who I often personally am connected to. As a distributor, I try to offer vast selection of material that includes tons of bands where is absolutely zero financial reason to sell. But only to cultivate dark underground. I firmly believe in cultural war, and while jaded bystanders giggle about meaninglessness of one more crappy raw BM tape, I firmly believe otherwise. XI) Is there any chance for a new STABAT MATER recording to emerge in the near future? Depends what means “near future”? Material is under preparation, but one never knows when or if it will eventually happen. It may be next week, it may be in 5 years or never. XII) What are your main influences, both musically and ideologically, what shaped you as the person you are? I’m too enthusiastic to be follower of one or few things. It’s question that can’t be really replied. I feel it’s more question of zeitgeist than specific individual examples. XIII) Aside from what you choose to release through Northern Heritage, do you keep up with today’s black metal or music in general? Any new acts from Finland worth listening to? I listen hours of material each day. Not necessarily black metal, but other kinds of obscurities. I keep up what happens in Finnish Black Metal scene, but I feel that a lot of motivations in metal scene are contaminated by modern world. There is a lot of decent stuff to listen to, but certainly black metal would need to be more than that. XIV) Thank you for the conversation. The final words are yours. ~ by antifleshnimbus on May 18, 2014.